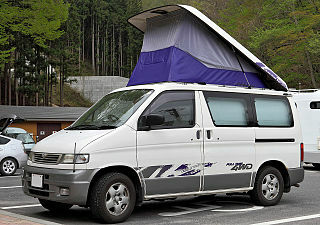 The Mazda Bongo makes a very nice smaller camper van that has the flexibility of a second car to allow you to use it more regularly than a large motorhome. In other words its size makes it a more versatile vehicle than many add to that the fact that many are automatic, have air conditioning and other car comforts and you have a second car that you can use as a camper at the weekend and for longer trips. You can even get a 4WD variant.Good condition, low mileage, rust free, second hand vehicles are being imported from Japan (where they drive on the same side of the road as us) that are available at a reasonable price. In Japan most areas do not use salt for snow and ice removal so Japanese cars tend to be lass affected by rust than vehicles that have been in the UK all of their lives. It is still a good idea to have this checked out and spend a few pounds getting your new Bongo undersealed with Waxoil to give it a long second life in the UK. If you want a Mazda Bongo camper you have a number of options. 1. Buy a factory completed campervan that came out of the Mazda factory originally as a camper van. 2. Buy one that has been professionally converted in the UK from an imported second hand vehicle. 3. Buy one that someone else has converted as a DIY project. This could either be from a kit or a bespoke interior. 4. Do one yourself either from scratch or using a kit. The suppliers below are not reviewed or recommended rather this list is provided to help you to do your own research. You can also have a pop up roof fitted to give you more room and make it into a 4 berth camper. Flat pack furniture kits for home conversion of Mazda Bongo and other small vans. Convert Your Van in South Yorkshire offer flat pack kits made from light weight plywood. Ply is much stiffer for any given weight than cheaper MDF or chipboard and is therefore a good choice for a campervan. They will also fit the kit for you if you are not confident or competent to do the job. Rock and Roll Beds a bench seat during the day a bed at night. Specialists offering fully converted vehicles to your specification. fit interiors made from marine ply with foil backing. Marine ply uses types of wood that are more resistant to moisture and the resin used to bond the veneers together is designed to keep it bonded in wet conditions. The foil gives this an extra layer of protection. Free Spirit are based near Chichester and have over 30 years experience of converting camper vans. Go Bongo You can hire a Bongo Campervan here.